A Winter Haven family is accusing Wal-Mart employees of kicking her 10-year-old son out of a motorized cart, even though, they say, he needed it. 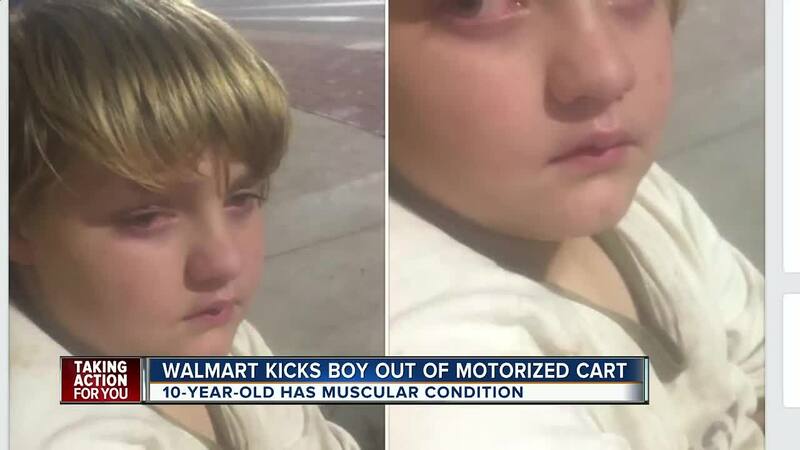 WINTER HAVEN, Fla. — A Florida family is accusing Walmart employees of kicking her 10-year-old son out of a motorized cart, even though, they say, he needed it. Tiffany Ferris started her now viral Facebook post with “Walmart did something very inexcusable,” and ends with pictures of her son, Cameron, in tears outside of the big box store. Ferris says her son needed the chair because of a muscular development delay which causes a lot of pain for the child in his legs. The mother claims employees told her child on two different occasions, during the same trip, to get out of the chair despite his pleas. The post has been shared more than 45,000 times and has garnered more than 31,000 likes. Facebook users on both sides of the case, saying Walmart is trying to protect those who actually need the chairs. Others asking Walmart to correct the issues.